When operating a rockbound transmitter such as my 10W one-valve 80m CW transmitter (pictured right), you will often get frustrated by QRM on your frequency that drowns out any station further than the end of your street. Or you hear someone calling CQ nearby but you can't get the frequency low enough to work them. Pulling the crystal via a variable capacitor helps a little but doesn't entirely resolve the situation. What you really need is a VFO. But if you don't want that complication, then a few extra crystals will help. I already had a crystal for 3.560 MHz, the international QRP calling frequency, and wanted one for 3.558 MHz the FISTS club calling frequency. An advantage of having two nearby frequencies is that if you're listening on 3.560 MHz without the CW filter, you can hear CQ's below you on 3.558. But, you can't buy a 3.558 MHz crystal anywhere, so you have to either have one made to order, or make one yourself as follows. Before that though, what about ceramic resonators? They are stable (though not AS stable as a quartz crystal) and they can be pulled over a much greater range. A 3.79 MHz ceramic resonator certainly covers the band of interest. So I tried one in my one valve transmitter, but the results weren't good. Basically the power dissipated in the crystal or ceramic resonator is quite high because it's a valve circuit, and the crystal gets quite hot. Unfortunately when using a resonator the heat results in a degree of frequency drift which is unacceptable, leading to severe "chirp". On key down, you can hear the transmitted note drop by many hundreds of Hertz in the first second or so of keydown. 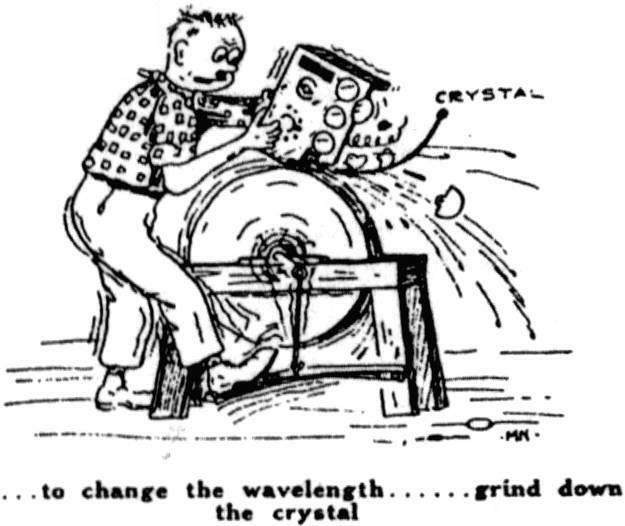 This idea for choosing your own crystal frequency comes from an article 'Penning Down' Crystals by Richard Wells G0RXH, published in SPRAT #99. In the article Richard recommends selecting a crystal frequency above the frequency of interest, and removing the case of the crystal and drawing on the surface with an indelible ink marker pen to lower the frequency. There are two types of crystal casing: resistance welded, and soldered. The soldered ones can simply be unsoldered, whereas the resistance welded ones must be sawn off. Unfortunately the only crystals I could get were resistance welded: it seems to be the current manufacturing method. I got two 3.579545 MHz crystals, they are very common as this is the television colour burst frequency. I had no luck sawing off the case of my crystal. Perhaps my junior hacksaw is just blunt. All I managed to to was break one of the wires off the crystal. Then I realised that the crystal slab is circular, whereas the metal can is rectangular: there must be some space in the corners. So I cut off the corners opposite the leads using wire snippers. It is possible to VERY CAREFULLY remove the case by cutting it with wire snippers, but it is all too easy to accidentally break the crystal. Interestingly, inside the crystal case is a woven fabric sheath. These pictures show the crystal I messed up. Lucky I had two of them (the other one had a missing wire due to the aborted hacksaw attempt, but at least the crystal was still connected). In this crystal, one side of the quartz slab became detached from its mast. The reason it looks a little melted on the left is because I wondered if you can solder to the silvered plate and thereby reconnect it. You can't. The next thing to do is build a simple crystal oscillator circuit. I always use the same type of 74LS04 oscillator circuit, shown here from my Huff & Puff stabiliser page. In this case I did not use a variable capacitor to pull the frequency. The usual Frequency Counter is used for frequency measurements. Then all that's needed it to start the art work. First I gingerly applied a small dot of ink to the crystal surface. The crystal stopped oscillating, but restarted a few moments later once the ink had dried. Exactly according to plan, the frequency was lowered! ("I love it when a plan comes together"). But not by much. By the time I had completely painted the entire crystal surface black with the indelible marker felt tip pen, it still wasn't down to 3.558. So I repainted it again with a second coat, and got the frequency down to 3.553. Too low! (Well it did say in the article it's difficult to get an exact frequency). Now for something not in the article, my own twist to the experiment - a little drop of the XYL's nail varnish remover on a cotton bud, with which a tiny bit of indelible ink can be gently removed. Taking the frequency back up to 3.565. Back and forth a few more times, a little more ink, then taking away with the nail varnish remover, and I got the frequency to 3.558 within 100 Hz. Nice. Nail varnish remover is mainly acetone and you can use it to remove all sorts of more useful stuff than nail varnish. Finally that delicate new crystal needs some protection. So I built a new case out of single-sided unetched copper PCB material soldered into the right shape. You can solder to the remainder of the crystal case, even if it's a resistance welded type. The picture to the right here shows the final result. It's about twice as big as the original crystal and isn't even air tight. Ugly, but it works great and you can even proudly write your new frequency on the case. Note that this is the crystal with the broken off wire due to the unsuccessful hacksaw attempt. I placed a wire over the stub and managed to connect it to the crystal case. So the lower of the two connections in the picture is just to the case, which is one terminal of the crystal. After building the new case around the crystal, the frequency changed by a few hundred Hertz. It moved some more when I put it in the transmitter as opposed to the IC test oscillator (transmitter measurements made by zero beating the transmit frequency with the receiver VFO). For this reason it's advisable not to fix the lid of the new case on too securely until you have made any final adjustments (a bit more ink) with the crystal in place in its final circuit. I have now had many QSO's on or near 3.558 MHz using my new crystal. It's great to have another frequency to escape to if there's too much TV timebase noise or something on 3.560. I have not noticed any adverse effects from the large amount of dried ink on the quartz surface. The output power of the transmitter is the same as with my 3.560 MHz crystal. Stability is the same, and the pulling range is if anything, greater. I get many good reports about the purity of my transmitted tone, and still get the same good comments when using this new crystal. Many thanks to Richard Wells G0RXH for his SPRAT article, and also to Radovan Vlacilik OM2ZZ who alerted me to the existence of the article. Ron Brink PA2RF wrote an article on penning crystals for the Dutch amateur radio magasine "Electron", published in the July 2006 issue. Click here to read Ron's article (in Dutch only). Here's a 7010kHz crystal I made for my one valve CW transmitter. The crystal was in a standard HC49 case which was cut open as above. The new case was constructed from an offcut of brass shim from the model shop, leftover from some other project. Here's a 10113 crystal I made another time, which was originally a 10240kHz crystal. I was amazed that it could be pulled that far! Shown also is the circuit diagram for the test oscillator which uses a 74LS00 quad NAND gate IC. "Thanks for reminding me about this technique... I put into practice this morning with success. The straight key century club (skcc) has been running special event stations (K3Y) in all of the US call districts this month, and a challenge went out to see who could use the lowest power to contact these stations. Fun. A year or so ago I built a Small Wonder Labs HiMite for 20 M. These were similar to the well-know Rockmites but featured a limited tuning range where the crystal could be pulled a few kHz. I had crystals for both 14.058 and 14.060 MHz installed with a switch to toggle between the two. There was, as you might guess, considerable overlap in frequency between them. Anyway, I decided to fire up the HiMite this morning in hopes of snagging another K3Y using a milliwatt rig. I could hear K3Y stations, but they were all too low in frequency for me to work them. Hmmm... what to do. "I decided to try penning an extra 14.060 crystal I had using a fine-point Sharpie pen. Since the example of removing the case on your website pretty much necessitated making a new case, I wondered if an alternate method could be done that would be speedier (these K3Y stations are on for just two hour stints). So, I figured out how to remove the case so that it could be re-used. I took my Dremel with the fine cutting wheel and carefully cut around the base of the crystal so the case could be removed intact. I then put a small dot of ink on the crystal, and checked its frequency: it had dropped about 5 kHz. Great! I put the case back on the crystal and carefully soldered it back to the base. When this crystal was mounted in the HiMite, I found that I was exactly in the right range to work K3Y/8 from West Virginia (Dave W3NP). When he finished working a station I sent my call and he replied with a 549... not bad for 500 mW! Next time you are in the mode to pen a crystal you might give this method a try. I think that it only took me 20 minutes start to finish. Of course, I was not aiming for a specific frequency just a general range so precision in penning was not required. ..."Actually, there was a detail I left out. When I began cutting, my skill, let's say, was not as good as when I finished. So, there was somewhat of a gap left on that side of the crystal can when I replaced the cover. I took a leftover piece of a resistor lead and laid it over that area and soldered it down. With it in place, I was able to completely reseal the can. One warning, use only the necessary amount of solder for the job; too much, and solder could get into the can and short the internal leads. Penned xtal - tuning range: 14.0532 to 14.0553; power out: 368 mW to 401 mW."